Barrio Fiesta is just around the corner, Maui! Then again fiestas have long been celebrated by each barrio or town in the Philippines for over 150 years. Just how many towns you might ask? The Philippines has approximately 1,489 municipalities according to the 2017 Philippine census. Each baranggay (formerly referred to as barrio, the smallest administrative division in the Philippines) has a fiesta. Municipalities and cities in the Philippines are subdivided into baranggays, except for the municipalities of Adams in Ilocos Norte and Kalayaan in Palawan with only one baranggay. 1,489 municipalities across the Philippines, multiply that to the amount of side and main dishes! The traditional fiesta in the Philippines is celebrated by neighboring baranggays near and far as a means of getting together and celebrating each community within each municipality. The traditional fiesta for each community is typically celebrated with music, games, entertainment and a plethora of food! Kankanen, kakanen or kalamay (above)—all types have a common denominator ingredient of glutenous rice and sugar. In the month of May, there is a fiesta in honor of the Blessed Virgin Mary in the Catholic Church. The fiesta known as Flores de Mayo in Antipolo is the most famous one. Bulacan also celebrates the fiesta of fertility and the image of Santa Clara is adorned in the hope of being granted a child. Although it’s good to know the reasons for such fiestas, personally, knowing the food specialty of each baranggay is even more popular! For one, it’s easier for me to relate food with certain areas and festivities. For instance, in Antipolo, I recall visiting their fiesta as a child in 1985 and going from house to house of total strangers just to have a small sample of their hain or handa, food specially prepared by each house for any guest who may stop by their homes. Odd tradition but it’s what we did back then. 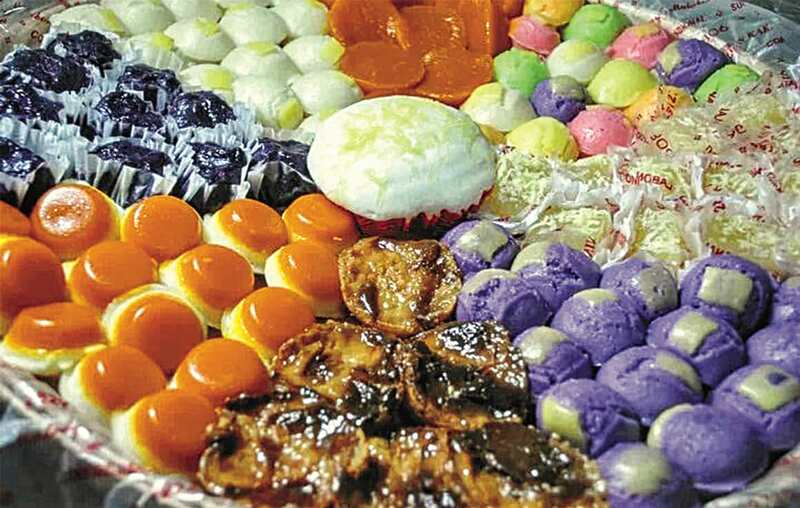 I recall seeing tables full of colorful food but the one constant in Antipolo was the suman. This particular suman is made from glutenous rice cooked in coconut milk. It is wrapped in palm leaves and steamed and becomes yellow in color. This treat is not sweet in taste so it’s partnered with sugar on the side. Speaking of suman, there are many types of suman. Another personal favorite is suman with kamoteng kahoy or cassava. This type of suman is wrapped in banana leaves instead of palm so the consistency is different than that of the rice. The cassava suman is made from grated cassava mixed with coconut milk and sugar. After it’s wrapped in banana leaves, it is then steamed to cook. I find that most Filipino desserts are consistent with clean eating (common with those who train or body builders). Although high in carbohydrates, the ingredients are hardy, natural, wholesome. Steamed and not fried. Coconut milk is the common fat used instead of butter or other types of vegetable oil. Ingredients are easily recognized by the body and easily broken down. Of course, having said that, moderation is still key. I’m not preaching over eating. Having a serving after a meal during the day, preferably in the morning, merienda is Sharon Zalsos approved. Having a serving later in the day closer to dinner and having more than one serving however is not. 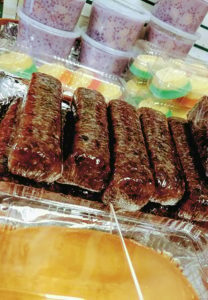 Biko rice cakes (above) are made with malagkit rice and coconut milk, with a dark brown topping. This Kankanen Biko can be found at Paradise Supermart. Traveling further south to Mindanao in the Philippines, desserts also vary. My Lola Cisay (lola: grandmother), originally from the island of Siquijor, made Iligan City her permanent residence after meeting my late Lolo Felipe. She learned to make baked goods to include the famous biko. Biko is also known as kankanen in the northern part of the country. In Manila, sweets or desserts are known as kakanen. My Lola’s recipe includes sticky rice (glutenous rice), water, fresh coconut milk, dark brown sugar/molasses a.k.a. kalamay in Bisaya. Caramelize the coconut with the sugar first, once thickened gradually add the already precooked sticky rice until everything is mixed. Once the pan is malagkit or sticky, move the biko in a baking dish lined with banana leaves. Let it sit and settle a little. Slice and serve. Each family developed secret ingredients and I can’t reveal my family’s. Mostly because I can’t remember what it is exactly. But if you know my mama Lilia and tasted her biko…then you have an idea of our family’s traditional biko recipe. 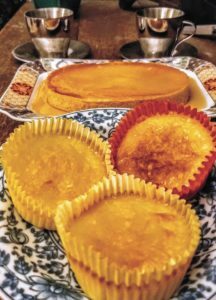 Leche flan (left) originating in Spain and France is a custard dessert with caramel topping. The Letche flan and coconut custard shown here is from Ilocandia Filipino Store in Lahaina. Another dessert famous with most Pinoys is the leche flan. France and Spain are noted as flan’s origin. Regardless of where and when this was introduced to the Philippines, it has become a part of our Pinoy eats and one of my favorites! Flan is basically a custard dessert with caramel topping. A close sister to this would be the crème brûlée. Sorry but if you have the perfect leche flan served to you, no crème brûlée can touch the perfection of that rich, creamy, sweet taste. Then again, I have a biased Pinoy panlasa (taste). Now, nostalgia has one dessert that will always capture my attention and that is binignit. Depending on where you are in the Philippines, this is also known as malagkit (sticky), bilog bilog (circular), or ginataan (coconut milk). All of these names describe the ingredients in the binignit or ginataan. In the Visayan regions, bananas are plenty thus making it the primary ingredient for binignit, followed by camote (sweet potato), sago (tapioca) and malagkit (glutenous/sticky rice), sugar and coconut milk. A perfect dessert for the rainy, cold season. This is also on my list of comfort food. Other ingredients can be added, again depending on the area in the Philippines and the abundant crop available. Langka or ripe jackfruit could be added for sweet taste, nata de coco or coconut jelly could also be added along with other fruits. While out and about with my children on the weekends, we frequent Filipino stores and local eateries to sample delicacies. While in Lahaina recently, we stopped by Ilocandia Filipino store and bought leche flan and pitsi pitsi for the kids to sample. When I’m at Paradise Supermart in Kahului, they make it so hard not to pick up kankanen located right in front of the dishes along the counter. So yes,…I will try to limit one small tray of kotsinta (orange in color) or suman. What about you, what is your favorite Pinoy sweets? 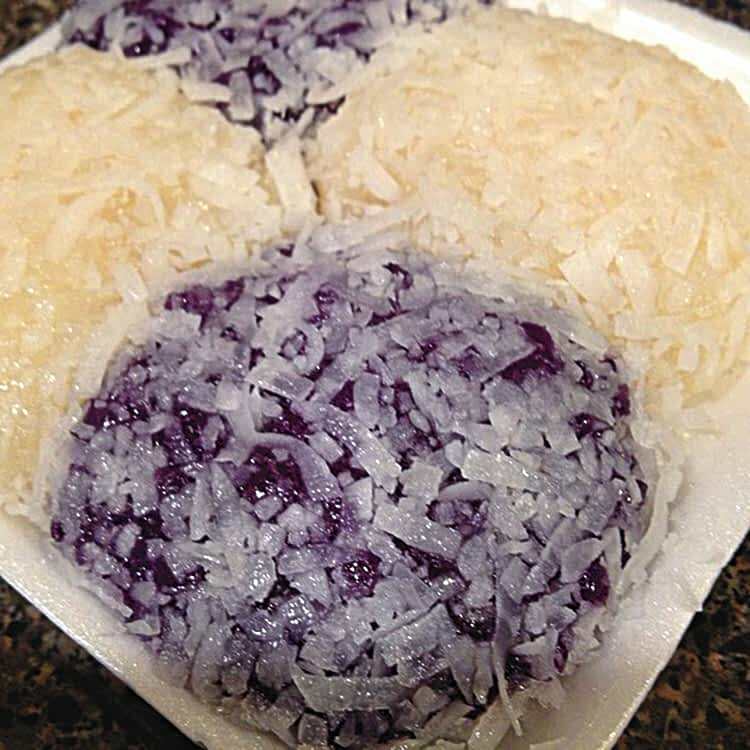 If you happen to see me out in the community or eating at your favorite Filipino eats, please don’t be shy and share with me what foods you would like featured in this column. Enjoy our local Maui Pinoy eats in moderation. 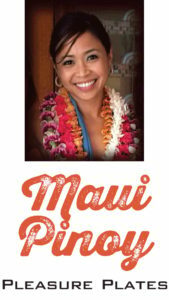 Sharon Zalsos is a past president of the Maui Filipino Chamber of Commerce (three terms) and has her own marketing business: Kalona International LLC. She’s also an ACN Independent Business Owner. A former Miss Maui Filipina, Sharon played the lead in MAPA’s presentation of Miss Saigon. A graduate of Maui High School, Sharon is employed with the County of Maui and a proud Veteran of the United States Air Force.